This is the official website for the Archdiocese to give information about our activities to further the Kingdom of God. The Archdiocese of Southwark is not responsible for the content of external web links, nor does it authorise any blogs. The content of blogs should be considered as personal opinion which may differ from diocesan policy. Today we enter into the Solemn Easter Triduum, which recalls the Passion, death, burial, and most importantly, the resurrection of Jesus. It is a period of three days, beginning with the evening liturgy of Maundy Thursday, emcompassing Good Friday and reaching its peak in the Easter Vigil. The Triduum denotes something of a different phase liturgically, with vestments changing from purple to white. During the Gloria on Maundy or Holy Thursday, both church bells and the organ may be silenced until the same point on Holy Saturday, when bells may ring out, the organ be played and lights resume their illumination of the church to represent the return of the Light and new life through the Risen Christ. The Triduum closes with evening prayer on Easter Sunday. St George's Cathedral in Southwark, click here. Good Friday may, on the surface of things, not seem all that Good, after all, the shadow side of human nature has jealously consipired to put to death the most perfect being: Jesus, God own son. Between the flogging, scences of humilation and the betrayal of the Apostle Jesus may have considered closest to him, it seems there is not one form of darkness that Jesus did not have to suffer before finally being condemned to carry his cross to Calvary. Here he would undergo the agony of crucifixion, be given a crown of thorns and mocked by those who had nailed him to the cross to suffer a painful death. All this when he had come as a man of peace. Firstly, God in his compassion granted him the assistance of Simon of Cyrene in carrying his cross and also the attentiveness of Veronica, his Mother and the disciple, John. Though many close to him betrayed him and hid, not all that loved him deserted him, showing the strength and testament of love which he had come to teach. 'Mine is not a kingdom of this world: if my kingdom were of this world, my men would have fought to prevent my being surrendered..... but my kingdom is not of this kind. 'You would have no power over me if it had not been given to you from above: that is why the one who handed me over to you has the greater guilt'. From these passages it is clear that, what may be have been seen from an earthly perspective as abandonement by God, our Father's plans for His Son at this point were entirely different. There was an unforeseen step beyond human understanding. The 'Good' in Good Friday is derived from a time when this word meant 'Holy', so therefore it would have been more commonly understood to be 'Holy Friday'. Through Jesus's sacrifice today, we see earthly death and despair, but Jesus defeats the devil through the ultimate gift of his llife, in all its perfection. In overcoming death he attains mercy for us all and a way to reach God directly so that we may be with him in our eternal home. Let us ask God to help us see though his eyes and not to judge through our own perceptions. His Kingdom is perhaps not a place of earthly logic or achievement, although our gifts are God given and we should use them. Rather, it is where God's love for his sons and daughters overcomes all manner of wrongs, of sin and despair. In his abundant mercy, love reigns. 'if I do not wash you, you can have nothing in common with me'. Peter goes on to ask Jesus to wash his hands and head as well, but Jesus tells him 'No-one who has taken a bath needs washing, he is clean all over. You too are clean, though not all of you are'. In this last sentence he refers to his forthcoming betrayal by Judas Iscariot. Essentially this is Jesus' command to the Apostles to serve others. drink it, do this as a memorial of me'. and drink this cup, you are proclaiming his death. Essentially this account, and those of the Evangelists, provides the scriptural basis for the Eucharist. In the Old Testament, blood sacrifices were required for atonement and cleansing when the Law was broken. Through the sacrifice of his body and blood, Jesus seals the New Covenant, that is, the mercy of God and the forgiveness of sins so that we may receive our eternal inheritance. We are looking for someone to join our site maintenance and caretaking team. The Diocesan site comprises St. George’s Cathedral, Amigo Hall, Archbishop’s House, Cathedral House, the Finance and Safeguarding offices and includes residential and office accommodation, as well as public access spaces and a car park. The primary function of this role is to provide maintenance and caretaking services across the whole site, but in particular for the Cathedral and Amigo Hall. The job includes delivering on a schedule of planned maintenance; responding to emergencies such as broken locks or blocked drains; providing access to the Cathedral and hall, including setting up as required by users; clearing rubbish and security. The successful applicant will have proven maintenance and caretaking skills preferably from a similar environment. Ideally he/she will have some health and safety qualifications (or a good grounding) and be able to undertake painting/decorating and have experience of basic carpentry and minor building works. This job will come into contact with a wide variety of people so good communication skills are essential. This job also requires a DBS disclosure. A uniform (e.g. t-shirts / fleeces/boots) will be provided. Hours: 35 worked over a varying shift pattern to include some evenings and weekends. Salary: £21,500pa - £23,000 depending on skills and experience. To apply please email your CV to sarahwood@rcaos.org.uk by 3rd May 2019. 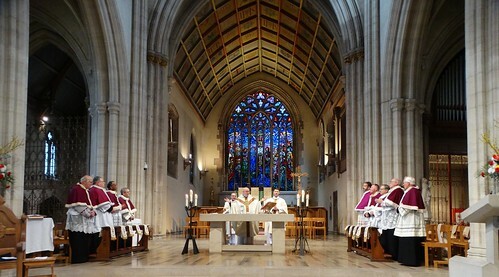 The Chrism Mass took place in St George's Cathedral, Southwark today. To read Archbishop Peter's Homily click here. To view photographs of the service, click here. To read more about the Chrism Mass and see our Prayer for Priests, see the article below. This Wednesday, 17th April 2019, the Diocesan Chrism Mass will take place in St George's Cathedral at 11.30 am. The diocesan family, that is clergy, religious and laity, are invited to gather for this unique annual service at which Southwark Priests will renew the commitment made on the day of their ordination and the people will be asked to pray for their priests in turn. The Archbishop will also consecrate oils which will be used for anointing during the administration of sacraments - outward signs of inward grace - throughout the Diocese during the coming year. and sharers of heavenly glory. This special oil will be used in the anointing of those receiving the Sacraments of Confirmation or Ordination, including reception of episcopacy. The Oil of the Sick will be carried to the Sanctuary by a member of the medical profession and the Oil of Catechumens will be brought forward by persons who will be baptised at Easter. The Oil of Chrism will be presented by individuals to be confirmed or ordained this year. of welcome and in preparing a body for burial. This simple product was clearly important throughout daily life. Even before the time of Jesus, anointing indicated a special calling from the Lord, with power granted to fulfil that vocation through the gift of the Holy Spirit. The essence was to dedicate a person or place as sacred in God's service. For example, Aaron and his sons (c.1250 BC) were consecrated as priests and anointed in the Tent of Meeting and the Ark of the Covenant. Blessed oil was also was used in the dedication of holy places and in the creation of kings such as Saul, David and Solomon. The symbolism of blessed oil in sacred rites is therefore rich and varied, serving in healing, strengthening, dedication and consecration. Together with the words and actions of a priest, sacraments flow into our lives, bringing healing, new life and the empowerment of the Holy Spirit in pefecting us as we journey closer to God throughout our lives. This is a immense responsibility and particular joy for our priests, who are themselves anointed as sevants of God and of the people. 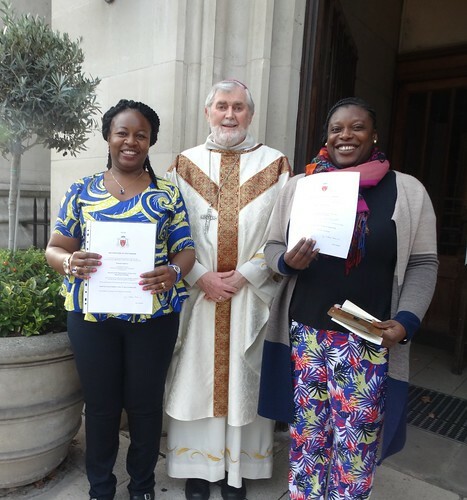 We ask you to join in thanking God for the anointed hands that will administer the sacraments throughout Southwark this year and for each ordained person as they turn their hearts and minds to God in the renewal of their ordination commitment. We pray that they may be humble and generous servants of the Lord. We thank you for the gift of our priests, who are called to be your mediators and to bring us your presence in the sacraments. Grant them the strength and to humbly fulfil their vocation: bringing the love of God to his people and your kingdom to life on earth. Empower their calling with the gifts of wisdom and discernment and give them the words they need to spread your Word. Help them to become instruments of your grace as they follow in the footsteps of Jesus. Give them joy in their ministry and enable us to support their calling through our appreciation and prayers. We ask this through Jesus Christ, our Eternal Priest. Amen. Jesus is hailed by the people as a spiritual leader and for many, the person who would help deliver them from Rome. As he enters the city, disciples wave palms and city crowds join them in throwing these and their garments in Jesus’ path as a mark of honour, shouting and singing ‘Hosanna’, which means ‘save now’ and ‘Blessed is the King who comes in the name of the Lord’. The palms themselves represent victory, triumph and goodness. However, in the liturgy today we also hear the rumblings of disquiet that lead the dramatic events of the week ahead. The Pharisees are heard to say ‘teacher, rebuke your disciples’ to which he answers 'I telll you, if these were silent the very stones would cry out'. Jesus himself knew aready that the tide would turn against him, having already wept with grief before entering the city in knowledge of Judas' betrayal, his own arrest, trial, scourging and crucifixion shortly to come. See photograph's of today's Palm Sunday sevice, celebrated by Archbishop Peter at St George's Cathedral. Watch an excerpt of the reading of the Passion at St George's Cathedral today. This weekened we celebrate Palm Sunday and the start of Holy Week, and we immerse ourselves in the life, death and resurrection of Christ through his Passion. If you haven't yet engaged with Lent it is not too late to turn your thoughts towards this season's three key pillars: prayer, fasting and almsgiving, and consider how you might be able focus putting your spiritual life in balance with the everyday world. For example, we may take food, entertainment or some other form of comfort for granted: forgetting that these are among the gifts given to us by God. Abstinence from food, for example, can give a keener sense of gratitude for something we may otherwise take for granted every day. Every small act of love and appreciation is viewed by God and it is never too late to turn to him and to be grateful for his generosity. It is also a particulary good time to consider receiving the Sacrament of Confession, in which you can unburden yourself of anything that you are carrying in your heart or mind which has damaged your relationship with God or caused separation with the body of Christ (other members of the community) with whom we are called to be one. The Sacrament of Reconciliation helps us to mend that separation so to that we can be individually and universally whole again. This Sacrament is not 'all about guilt' but it helps us to recognise our need to turn away from actions which distance us from God, enabling us to make a fresh start with our Father, who is always ready and eager to forgive. It can help us to know ourselves and on a regular basis, assists us in being aware of our weaknesses, enabling us to make better choices in the future. In turn, God offers us healing, pardon and peace through absolution given by a priest (God's mediator on earth). Why not consider attending a Reconciliation Service in your parish this week to prepare for the new life that Easter brings, or otherwise check the Confession times in your parish and consider receiving the sacrament during Holy Week. We are pleased to share the exciting news that the Cathedral Choir are hosting a recruitment day for new choristers. This will take place on Saturday 4th May from 10 am - 4 pm in the Cathedral Song Room. During the day there will be warm-ups, singing games, individual auditions, group rehearsals, social activities and you may even get a brief chance to conduct the choir in rehearsal! There will be a final performance for friends and family in St George's at the end of the day. Singing in a cathedral choir is a truly unique opportunity which offers an array of benefits. In addition to a first-rate musical education they include learning to work as a professional team, building confidence, honing performance abilities and nuturing social skills. Furthermore, choristers are also likely to form friendships that will last for years to come. Each young person will receive individual singing lessons and there will be opportunities to record CDs, sing at major church services in the Cathedral and engage in musical events with other choirs. In recent years St George's Cathedral Choir has also broadcast on both Radio and TV. If this sounds like an appealing opportunity to develop musical abilities develope life-skills and make lots of new friends, why not find out more? Called to a Life of Prayer? The Sisters of Minster Abbey, near Ramsgate, will be running a 'Come and See' weekend between 12th - 14th April 2019, for women who are interested in exploring the contemplative life. During the weekend there will be a time to meet and talk with the Benedictine Sisters in a relaxed environment, to join them in their work and prayer, and to hear some of their vocation stories. Church leaders will stand alongside young people, families and communities affected by the scourge of violent crime at the Standing Together public rally against knife crime and youth violence this Saturday 6th April 2019. The rally is an ecumenical event and will be held from 2pm to 4pm at Trafalgar Square in central London. Church leaders believe that this violence affecting young people must be challenged and so will stand shoulder to shoulder with those most affected, united in demanding action and encouraging communities to come together. 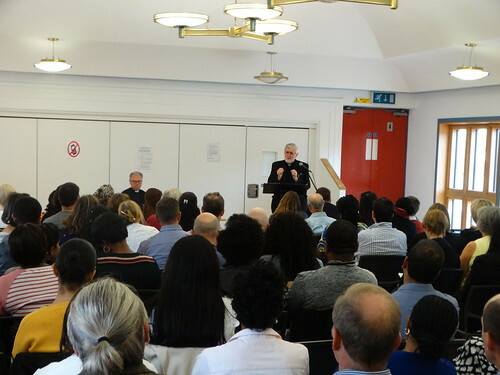 Bishop Pat Lynch has met with a number of school headteachers and parish priests in recent months to look at the factors conributing to knife crime and youth violence, particularly in South London, and to look at ways to tackle these issues. On Saturday 6th April The Purcell Singers will be giving an evening concert in St. George's Cathedral, Southwark.. The concert will feature sacred choral music on the themes of Lent and Holy Week, including Allegri’s Miserere and Barber’s Agnus Dei, and will be conducted by Jonathan Schranz, the Cathedral’s Director of Music. Tickets are available on the door priced at £15 / £12 concession. Pope Francis has released his Post-Synodal Exhortation 'Christus Vivit' (Christ is Alive) to Young People and to the entire People of God, following the Synod of Bishops in October 2018. The theme of the Synod was "Young People, the Faith, and Vocational Discernment". The Bishops' Conference of England & Wales took three delegates to the Synod of Bishops in October 2018: Cardinal Vincent Nichols, Archbishop of Westminster, Bishop Ralph Heskett, Bishop of Hallam and Bishop Mark O'Toole, Bishop of Plymouth. “What a joy it is to receive this Post-Synodal Exhortation 'Christ is Alive'. Reading it brings back all the best features of the Synod of Bishops we attended last October: the vitality of young people; their love for the Church and for us Bishops; their willingness to face the difficult challenges before us; their capacity for prayer and a living, loving relationship with Jesus. We thank Pope Francis so warmly for this remarkable document which will now be poured over by many young people and brought to bear on their lives. “The closing words of this Exhortation will be so welcome: 'The Church needs your momentum, your intuitions, your faith. We need them! And when you arrive where we have not yet reached, have the patience to wait for us' (299). “The Pope writes with great vigour of the message of the Living Christ and invites young people to 'make the most of these years of youth' (143), in friendship with Christ (150), in 'strong social friendships' (169) and always as 'courageous missionaries' (175). The Southwark Catholic Youth Service will be holding an event for volunteer youth leaders later in 2019 in order to unpack some of the themes of the document in terms of engaging young people with Church. Further details willl be available in due course. The Southwark Spirituality Commission and Stewardship Team continue to offer their daily Lenten Reflections. If you have not yet signed up to receive these seasonal thoughts, it is not too late to do so, thereby supporting your personal journey throughout Lent. The experience of defeat by the Babylonian Empire was utterly devastating for the Israelites. Jerusalem and the Temple had been destroyed, their king and the leaders of the nation taken into captivity. All that they believed about their God was called into question. Had he gone back on his promise? Now, the Lord reassures them that the mighty deeds of the past are not simply ancient history, but in fact describe God’s very nature. The Israelites can be confident that God will continue to act in the same powerful way for them. Today take 10 minutes to read all of Chapter 43 as addressed to you. Let yourself experience God’s tender love for you as God’s beloved child. This Saturday, 30th March 2018, we encourage alll Catholics to consider the value of creation by joining in Earth Hour at 8.30 pm, which is being promoted by the World Wildlife Fund. Nature not only provides us with all the things we need to live - from the air we breathe to the water we drink, and from the shelter we need to the economy we rely on - but also makes our lives better. However, its growing loss puts this all under threat. From this weekend onwards, the April edition of The Pilgrim, Southwark's Diocesan Newspaper, will be available in parishes. You can hear from the Director of the Catholic Centre for Formation, Dr Mark Nash, on the continuing call to conversion and need for positive participation in our communities in order to transform society. In addition, the new Director of Music at St George's Cathedral, Jonathan Schranz, explains some of the incredible benefits of a musical education as he seeks committed new choristers. 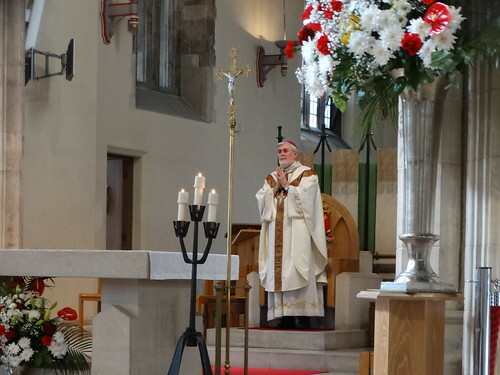 Derek Williams explores the Dowry of Our Lady and Walsingham, whilst our youngest writer who is an altar server in Battersea, Kacper Zdrada, offers his thoughts on the recent CYMFed FLAME event for young people at Wembley. At only 50p, The Pilgrim is a great way to find out more about the life of our vibrant Diocese. We would like to offer our warm congratulations to Father Pat Zammit on the occasion of his Golden Jubilee, which he celebrated with Archbishop Peter, fellow priests and his congregation in St Vincent's Catholic Church in Dartford on 22nd March 2019. We wish Fr Zammit many more happy years of priesthood. We pray that, inspired by Fr Zammit's example of service and love, young people will be open to the call of Christ to serve in the Priesthood and Religous Life. On the evening of 19th March 2019, Archbishop Peter celebrated the Diaconal Ordination of Patrick Pullicino in St Anselm's Roman Catholic Church, Tooting Bec. Deacon Patrick discovered a valuable calling to Priesthood in later life, for which which he will continue to train over the following year. We wish Deacon Patrick every blessing for his future ministry. If you are interested in exploring whether you may have a vocation why not attend an informal Gaililee Group Meeting with our Southwark vocations team? For additional photographs of the service click here. On Saturday 23 March at 12.30 pm a Mass and Blessing of the Diocesan Romero Shrine, with its new Shrine Gates (pictured above), took place in St George’s Cathedral, Southwark, in conjunction with the Romero Trust. Archbishop Peter Smith presided and was joined by the Vicar General, Monsignor Matthew Dickens and the Cathedral Dean, Canon Richard Hearn. The new gates are unique in design, with the railing element taking the shape of the sword of St George. Why not come and say a prayer at the Shrine dedicated to the Patron Saint of Christian Communicators and view the gates in person. To see more photographs of this service visit our Diocesan Flickr page. OnThursday 28th March Pierpaolo Finaldi from the Centre for Catholic Formation will give a talk on Mozart and the Requiem Mass. The doors of the CCF will be open from 7 pm and the tallk will take place at 7.30 pm. As we head towards the end of the working week, why not indulge in learning more about this sublime and masterful composition? Light refreshments will be available and entry is free. Today, Friday 15th March 2019, CAFOD, the overseas development agency for the Catholic Church, is asking whether we can all have a simple meal and donate the extra money we would usuallly spend, so that, for example, they can buy a bag of seeds to help a family provide for itself elsewhere in the world. Many of us are blessed with rich resources compared to others in poorer countries. Please consider giving today so that others can share in our health and wealth. To visit the CAFOD page and to donate: click here. Scripture, the Bible, is at the centre of everything the Church does. The year 2020 will be the 10th anniversary of Verbum Domini; Pope Benedict XVI’s Apostolic Exhortation on ‘The Word of the Lord’ and the 1,600th anniversary of St Jerome’s, who translated the Bible into Latin. These events have inspired the Catholic Bishops’ Conference of England and Wales to make 2020 a year of focus on the Bible and 'The God Who Speaks'. Throughout the year there will be a range of resources and activities for Southwark and beyond. As part of the preparations for the 2020 Initiative – The God who Speaks: The Year of the Word - The Bishop's Conference are conducting a very short survey about how we see and use the Bible. We’d like to ask as many Southwark Catholics as possible for their help iin completing this short survey, so that we can get a snapshot of our current relationship with the Scriptures. In this way we can all help to make 2020 a special celebration of this core aspect of our faith. 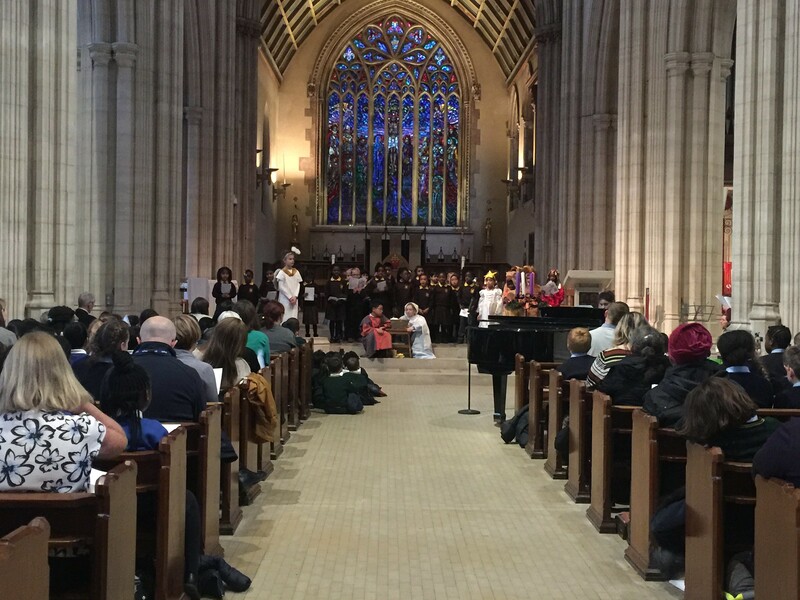 The Diocese was delighted to welcome so 254 catechumens and 160 candidates, plus their godparents, sponsors and families to St George's Cathedral for the Rite on Election and Continuing Call to Conversion on Saturday 9th March 2019. Canon Richard Hearn, Dean of the Cathedral, warmly greeted the congregation, whilst Dr Mark Nash of the Centre for Catholic Formation stated that it was good to see so many people and encouraged catechumens and candidates to stay true to the path of communion and continuing conversation with the Church this Easter. He went on to say that there are many opportunities to be involved in the life of the Church and that it is good to feed and nuture active participation and continue learning. Bishop Paul Hendricks, Bishop Pat Lynch and Monsignor Matthew Dickens presented catechumens and candidates from across the Diocese to Archbishop Peter: each person rose from their seat as their name was called. Archbishop Peter advised the congregation to always keep in mind the two Great Commandments, to love God and also your neighbour. He also asked all those supporting catechumens and candidates to continue praying for them as they moved towards Easter. Finally the congregation in the Cathedral, which was filled with radiant sunlight, raised the roof with joyous singing, led by Canon Alan McLean and the Diocesan Choir. Please continue to pray for alll those who will enter the Church and receive Sacraments this Easter (see the Diocesan Prayer below). To see photographs of the service click here. Many of us struggle to find time for prayer everyday but if one of your Lenten promises is to make time, Southwark’s Spirituality Commission is on hand to help! The Commission is producing a short online Lenten reflection for each day of this penitential season. All you have to do is sign-up by email and they will send the reflection to your inbox every day. Archbishop Peter has written a Pastoral Letter to be read on the Sunday before Ash Wednesday 2019, the Eighth Sunday of Ordinary Time - Sunday 3rd March 2019. Every year, the season of Lent offers us the opportunity to stand back a little from our daily concerns, and reflect on our lives in the light of the Gospel. As the great philosopher, Socrates said so wisely, “The un-reflected life is not worth living.” Yet we all know from experience that in the hectic and frenetic world in which we live today, it’s quite difficult to make time to reflect - to reflect on our lives, its meaning and where it is heading. The Church gives us the season of Lent as a time to recall, and to reflect on the meaning of our baptism and the commitment which flows from it. Lent is the season for each of us to enter into a closer union with the person of Christ and to reflect on how we deal with the temptations which afflict us all in different ways. To do that fruitfully we need to be serious about the three traditional helps towards that end, namely, prayer, fasting and almsgiving. On Saturday 2nd March 2019 over 8000 young people took part in CYMFed's dynamid FLAME Congress in Wembley SSE Arena, the biggest bi-annual Catholic youth event in England and Wales. Those gathered heard from an array of inspirational musicians, clergy and speakers, including Guvna B, who had the whole Arena raving, and his wife Emma, who is the co-founder of 'Gal Got Faith'. The powerful Dallas preacher, Robert Madu, also wowed the audience with his high occtane delivery of two key messages to 'stay in your lane' and 'keep your eyes on Jesus. Those gathered also heard from Archbishop Eamon Martin, Candice McKenzie, Southwark's Natalie Christian-John and the uplifting Gospel Youth Choir and Cardinal Vincent Nicholas amonst others. Throughout the day, young people were encouraged to to find their own significance by focussing on God's plan for their lives and by keeping their eyes firmly on Jesus. Serious teaching was followed by a great deal of singing, dancing and rejoicing. The day ended with a moving piece of drama by RISE Theatre, depicting Christ reaching out to us through the Eucharist, offering healing and consolation. Finally all gathered entered into a period of quiet Adoration in front of the Blessed Sacrament, led by Cardinal Vincent Nichols. To see photographs of the day click here. The CCF will also be holding a Study Day for Extraordinary Ministers of the Holy Eucharist and Readers at St Stephen’s Parish Welling between 10 am to 2.30 pm, with Fr Denis McBride on Saturday 9th March 2019. Please book via this link to attend. Saturday 23rd February between 10.30 am - 3 pm, Sr Hyacinthe Defos du Rau and Margaret Wickware will hold an introductory day for a new First Holy Communion programme, 'I want to make my home in you' at the Centre for Catholic Formation in Tooting Bec. Whether you or your parish are looking for a new resource, or would simply like to come along, share thoughts, gather information and take part in discussion on family catechesis, you are very welcome to attend. Books will be available to purchase from the excellent CCF Library. Please bring your own lunch. To visit the CCF website, click here. Archbishop Peter will preside at the final Mass, which will take place at 12.30 pm on Saturday. All are welcome to attend this attractive and informative exhibiton and spend time praying at Mary's Holy House (pictured above). For full details of the schedule click here. To view photos of the Dowry Tour Exhibition, click here. Since his 2008 major label debut, Matt Maher has become a staple in the artistic and songwriting community. An eight time-GRAMMY nominee, he has garnered multiple radio successes writing and recording songs like “Lord, I Need You,” “Hold Us Together,” and “Christ Is Risen”. In 2013, Matt had a career highlight performing at World Youth Day in Rio in front of Pope Francis and a crowd of 3 million people. In addition he performed in 2015 in downtown Philadelphia as part of the World Meeting of Families with Aretha Franklin and The Fray, among others. He has penned songs recorded by Chris Tomlin, Crowder, Third Day, Matt Redman, Hillsong, Casting Crowns, Jesus Culture and Bethel among others. Matt has written or co-written five No. 1 radio singles. Places for this exciting event are limited and seats are sellling fast, so please book early to avoid disappointment. Tickets are priced £10 each (to cover event costs). On Tuesday 12 February 2019, Pope Francis cleared the way for the canonisation of the much-loved Cardinal, educationalist and literary figure,, Cardinal John Henry Newman. Cardinal Vincent Nichols, President of the Catholic Bishops' Conference of England and Wales has warmly welcomed the news that Cardinal Newman will be declared a saint. intellectual clarity and cultural sensitivity make him a deeply. that this is an English parish priest being declared a saint. high today knowing Cardinal Newman is declared a saint." John Henry Newman was ordained Priest in the Church of England and was a theologian, poet and academic. As leader of the Oxford Movement he was a skilled speaker and was attracted to the idea of incorporating some Catholic beliefs and liturgical rituals from before the Reformation into the Church of England. His interest eventually led him to leave teaching at Oxford University and the Anglican Communion, with ordination to the Roman Catholic priesthood folllowing shortly after. As an author, he penned works such as his autobiography Apologia Pro Vita Sua, Loss and Gain and the poem The Dream of Gerontius which was famously set to music in 1900 by Edward Elgar. Meanwhile, his interest in education continued as he helped to found the Catholic University of Ireland which later became University College, Dublin. Newman was declared 'Blessed' by Pope Emeritus Benedict XVI on his historic state visit to the UK in September 2010 and he is Patron of the Personal Ordinariate of Our Lady of Walsingham. On 8th February we celebrate the Feast Day of St Josephine Bakhita, Patron Saint of Human Trafficking Survivors. The Pope's monthly Prayer Network video relates to those who have been trafficked, suffered from explotation or violence. There are an estimated 40 million victims of modern slavery worldwide, which now ranks as the second most profitable worldwide criminal enterprise. It is a serious crime in which people are coerced or deceived into a situation where they are exploited. This can take many forms including; forced labour, sexual exploitation, domestic servitude, forced criminality and even organ harvesting. It is believed that modern slavery affects every country in the world in the UK some recent figures suggest there are in excess of 100,000 victims hidden in plain sight. This year the particular focus is on those who are caught up in forced labour and labour exploitation both in the UK and beyond. Today we are asked to pray for those that have not only survived human trafficking but for all those affected by modern slavery and human trafficking, as well the people that volunteer and work to eradicate this crime. Born in Darfur (Sudan) in approximately 1869, Josephine Bakhita experienced a happy early life with a large, well respected family, where her uncle was the village chief. In the early part of 1877, she was abducted by Arab slave traders and forced to walk almost 1000 km to El Obeid, being sold twice before reaching this destination. During the next 12 years she was sold three more times and given away once; she was once beaten so badly for dropping a vase that she couldn’t move from her straw bed for a month. Eventually her last owner, Augusto Michieli, acquired a large hotel near the Red Sea and decided to sell his property in Italy and to move his family to Sudan on a permanent basis. It took some time for transactions to be processed and his wife wanted to visit him in Sudan before everything was ready. Their family villa in Zianigo was already sold and therefore Bakhita and their daughter, Mimmina, needed a temporary place to stay. 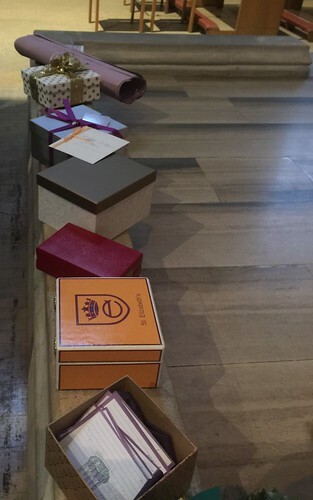 They were given to the care of the Canossian sisters in Venice. Having previously been forced to convert to Islam, Bakhita encountered Christianity for the first time and she often recalled: "Those holy mothers instructed me with heroic patience and introduced me to that God who from childhood I had felt in my heart without knowing who He was." When Mrs Michieli returned to retrieve her daughter and maid, Bakhita flatly refused to leave. A legal wrangle ensued but In 1889, an Italian Court ruled that it did not recognise slavery and therefore Bakhita had never lawfully been a slave. Bakhita went on to be baptised in 1890 and entered the novitiate in 1893 with the Canossian Sisters. She took her vows in December 1896 and was noted for her gentleness, sanctity and ready smile! She was canonised by Pope John Paul II in October 2000 and Pope Benedict XVI offered her life story as an outstanding illustration of Christian hope in his encyclical letter, Spe Salvi (In hope we were saved). May we too, find our way to hope and freedom through Christ. We pray especially for those enduring the evil of human trafficking at this time, and for those endeavouring to eradicate this blight on our modern society. St George's Cathedral has a vacancy for a Cathedral Manager to assist the Dean with the administration of the Cathedral and manage the diary bookings for the Cathedral and Amigo Halls. The ideal candidate will posess good attention to detail, be of a friendly and professional disposition and have sympathy with the mission of the Catholic Church. The post is part time: 28 hours per week. Please direct enquiries to Sarah Wood on sarahwood@rcaos.org.uk. The Archdiocese of Southwark is looking for an office administrator to join our Safeguarding team in SE1. This is a full time job (0900 – 1700 Monday to Friday) and is offered initially on a 12 month fixed term contract. The key areas of work are administration of the DBS Disclosure application process, maintenance of national and local databases, administrative support to the Safeguarding training programmes and assistance in delivery of training as necessary, maintaining and updating of policy documents, forms and procedures and taking notes at safeguarding meetings. The ideal candidate will have a strong commitment to the safeguarding of children and vulnerable adults and will preferably have experience of working in this area. Excellent IT and communication skills coupled with evidenced understanding of confidentiality are also essential. Salary: £23,000pa - £25,000pa depending on skills and experience. If you would like to apply for this job please email your CV to sarahwood@rcaos.org.uk by 22nd February 2019. 4 pm: reception of the body at St Mary Magdalen's Church, Mortlake. 7 pm: Vigil Mass at St Mary Magdalen's Church, Mortlake. 12.30 pm: Funeral Mass at St George's Cathedral, Southwark. 7 pm: Vigil Mass at St Illtyd's Church, Dowlais, Wales. followed by the burial service. Cardinal Nichols has actively welcomed the launch of the independent inquiry into Christian persecution around the world, ordered by the government, at a meeting this week in London with the Foreign Secretary Jeremy Hunt and the Bishop of Truro, Rt Rev Philip Mountstephen, who will be leading the investigation. The inquiry, announced before Christmas and due to report back by Easter with its recommendations, was set up as Mr Hunt admitted the UK should be doing more to help Christians. The government estimates that 215 million Christians across the world face persecution on account of their belief. Last year, 3,000 were killed because of their faith. The Marriage and Family Life Commission will be offering a day for couples focussing on the essential element of communication: something which it can be easy to take for granted in our busy day to day lives. Booking is essential, so if you are interested please click here to download an application form. 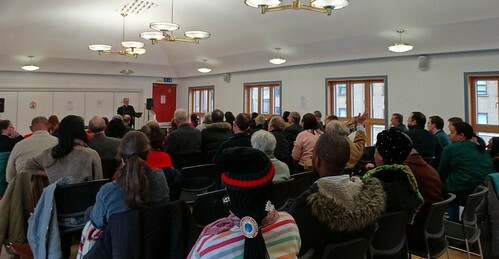 On 16th January, at the invitation of Father Victor Darlington, four headteachers, a student support officer, Bishop Patrick Lynch and Father Gerard Mulvihill held a meeting at Sacred Heart School, Camberwell, in order to look at how the Catholic Church and schools support each other in tackling youth violence and crime in the community. The meeting was set up to focus on sharing effective approaches towards these concerns and how to address the prevailing culture of fear. In addition the meeting considered how it could effect positive change and improve behaviour support in our school environments, as well as looking at how the Catholic Church and schools support parents in raising children to resist violence through their faith. Father Victor chaired the meeting at which the participants shared their concerns about knife crime, drugs, gangs and muggings as well as other issues that impact these matters, such as poverty, homelessness and literacy. Practical suggestions for a coordinated approach to changing this destructive culture has now been put together. The Mayor of London also recently launched the ‘London Needs You Alive’ campaign and with a range of resources. Click here to learn more. There are also some excellent photographs from the Holy Land on the CBCEW Flickr website. Click here to see more. Parishes, schools and individuals in Southwark Diocese are being invited to nominate young people. If you know an unsung hero or heroine or a group that have worked together to help their community put them forward for an award now at www.millionminutes.org/awards. The award nominees will be invited to attend a special ceremony in London’s West End in July. Cardinal Vincent Nichols will be the guest of honour and present the Pope Francis Award to one lucky young person. The 'Celebrating Young People Awards’ was launched in 2015, inviting nominations for six award categories based on Catholic Social Teaching. There is also an award for an inspiring youth minister and the main youth Award, the Pope Francis Award, selected and presented by Cardinal Vincent Nichols. Nominations for this year's awards close on 24 May 2019. 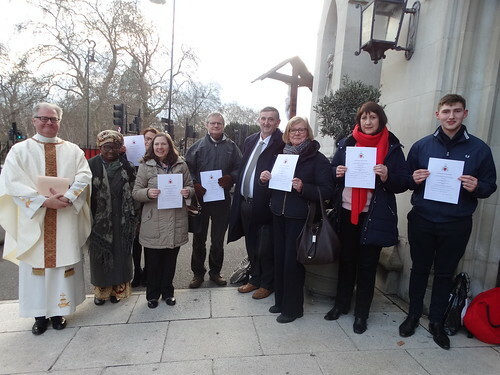 On 18th January, at the invitation of Churches Together in South London (CTSL), Senior Church Leaders joined together at the Methodist Central Hall in Westminster in order to witness to friendship and the shared purpose of Christian Unity. Bishop Paul Hendricks, Auxiliary Bishop of the RC Diocese of Southwark, offered a reflection at the invitation of Bishop Karowei Dorgu, Chair of CTSL. Bishop Paul talked about some of the ideas raised in Richard Rohr’s book “Falling Upward”, and the leaders discussed their relevance to ecumenism today. Reverend Jongikaya Zihle raised themes from the resources for this year’s Week of Prayer for Christian Unity. It was powerful witness to fellowship and discussioj between denominations in South London, and to see this large group of Christian leaders joining together to pray, reflect, discuss and eat together at a time when unity and partnership is crucial for our city and the world we share as a society. The Tribunal is responsible for managing applications for marriage annulments for the Archdiocese of Southwark. The administration team prepares all of the applications prior to them going to judgment before the Judicial Vicar / Presiding Judges and they are now looking for a new secretary to join this team. Based at the Centre for Catholic Formation in Tooting Bec, this post will gather together all necessary documentation; interview relevant parties and prepare documentation to go before the Judicial Vicar / Presiding Judge. The ideal candidate will have excellent secretarial/administrative experience and be very competent with IT (Microsoft Office). He/she will have good communication skills, especially in client interviews when a sensitive and empathetic approach to clients is required. An ability to work on your own initiative and some knowledge of the workings of the Catholic Church is also essential. 0900 – 1700 Monday to Friday. Salary range £23,000pa - £25,000pa depending on skills and experience. The Week of Prayer for Christian Unity takes place between 18th - 25th January 2019, the octave of St. Peter and St. Paul. This year the theme is "Justice, and only justice, you shall pursue", inspired by Deuteronomy 16:18-20. During a General Audience this week the Pope pointed out that "ecumenism is not something optional," and that it aims "to develop a common and consistent witness that promotes true justice and support for the weakest through responses that are concrete, appropriate and effective". Pope Francis also pointed out that we are called to pray so that all Christians may once again be a single family, according to God’s will, so that "they may be one, that the world may believe" (John 17.21). Each year, Churches Together in Britain and Ireland adapt resources for the week and Christians from Indonesia have contributed to their development this year. Indonesia is the largest country in South East Asia, made up of more than 17,000 islands, 1,340 different ethnic groups and a significant number of languages. About 10% of Indonesians are Christian and all live by the principle of gotong royong which is to live in ‘solidarity and by collaboration’, regarding all Indonesians as brothers and sisters (86% of Indonesians are Muslim). However, this principal often sits ill-at-ease with the country's liberal economic outlook, which has inspired growth but also corruption. This is now negatively affecting affecting politics, business and the environment. For this reason the theme 'Justice and only justice you shall pursue' was chosen. For more information visit the Churches Together in Britain and Ireland wesbite: click here. If you are lookiing for a simple way to become involved in the Week of Prayer for Christian Unity, why not consider praying for this cause either at home or in your local church between 18-25 January. It may also be possible to attend a joint service or event organised by a local Churches Together group (check your Newsletter) or attend a service in another Christian denomination during this period. If you are technologically inclined, you can also show your support on social media. Add the #wpcuwall hashtag to your Twitter post or find updates about the Week of Prayer for Christian Unity by following the #wpcu2019 hashtag. 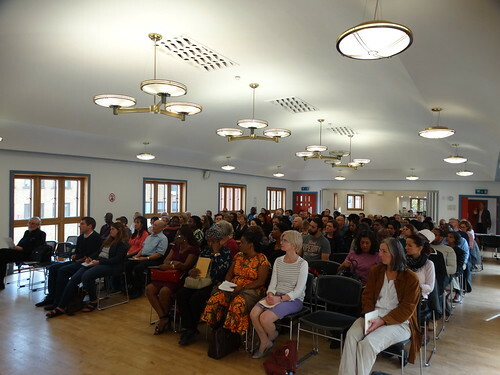 To learn more about the work of the Christian Unity Commission in Southwark, click here. We pray that we may all be seek to be united in heart and cherish a spirit of unity, so that we may grow together towards Christ. Today an estimated 1500 refugees live on the streets in the North of France around Calais and Dunkerque. They sleep rough, under bridges, in fields exposed to cold, rain and violence. Several times each week all tents and sleeping areas are cleared by the CRS (French Riot Police). However, on a daily basis volunteers distribute drinking water, food, clothes and sleeping bags and show their care for those who are displaced. There are a lot of basic needs and hardship, but together the refugees and volunteers are able to experience moments of happiness as part of a community and find relief from difficult times. Maria Skobtsova House and Caritas France (Calais) are part of the Church's response to the needs of refugees. They are currently seeking volunteers in good health between the ages of 18 - 99 years to help in a variety of roles. This could be anything from serving tea or helping in the Soup Kitchen to driving or offering IT skills. They are ideally looking for minimum committment of 1 month from volunteers, although those who can offer specific skills would be considered for a shorter period. The Archdiocese of Southwark is delighted to announce that two significant treasures with which it is associated are now available for the general public to view. The British Library is currently exhibiting the Southwark Book of Hours, which is on display in the Sir John Ritblat Treasures Gallery (Additional manuscript 89309). This will item be available to view for a minimum of six-months and visitors will be able to compare interpretations of set religious texts through different books. The manuscript was formerly on long-term loan from the Archdiocese, along with 3 other books of hours, but has now been acquired by the British Library as part of their permanent collection. Written in French and Latin, the Southwark Book of Hours is thought to have been produced in Paris in approximately 1390 for a noblewoman, who appears to feature in two of the illuminations. A partial coat of arms within the book, which may have been trimmed when it was rebound in the 19th Century, may be that of the Berthelot family of Normandy. The book is decorated with fine gilded illuminations which have been attributed to the highly accomplished artist known as the Ravenelle Master, who also worked for the avid collector of illuminated manuscripts, Duc Jean de Berry (1340-1416). It comes with a bookplate of St George’s Cathedral Library but the history of its journey to Southwark is not fully known. Many books of hours were made for noblewomen and there is evidence that they were sometimes given as a wedding present from a husband to his new wife. Dr Kathleen Doyle, the British Library’s Lead Curator of Illuminated Manuscripts, said: ‘I am delighted that the Southwark Hours is joining the Library's remarkable collection of illuminated manuscripts, including treasures of French illumination and Books of Hours from across Europe. The manuscript is an important witness of the Ravenelle Painter’s work, and one of only two that indicates that the he worked for aristocratic female patrons’. At the same time, The National Gallery is displaying a painting by Cornelius Engebrechtsz entitled ‘The Lamentation with Donors and Saints which is on loan from the Archdiocese of Southwark for a period of 3 years. This painting was acquired by the 15th Duke of Norfolk in 1902 and passed on, by descent, to the 16th Duke of Norfolk, who gifted the painting in 1948 to the collection of the Office of the Archbishop of Southwark. The painting consists of oil on panel and it has been re-framed by the Gallery in a manner which reflects the period in which it was painted (circa 1510-1515). The Gallery Director, Gabriele Finaldi, said, 'I am delighted we can show Engebrechtsz's beautiful Lamentation to the public in the context of our Netherlandish pictures here at the Gallery. He is a rare artist in British collections and this is a superb example of his work as demonstrated by the delicate execution, the elaborate draperies, the attractive landscape and the exquisitely expressed emotions of the figures surrounding the dead Christ'. All are welcome to visit these unique treasures: admission to the British Library and National Gallery to see these items is free of charge. For those interested in Catholic Art and Culture, why not consider attending the Faith and Art series at the Centre for Catholic Formation in Tooting Bec. Their latest series will feature Fr Lawrence Lew OP on photography (31 January 2019); Dr Victoria Seed on Literature and the Catholic Imagination (28 February 2019) and Pierpaolo Finaldi on Mozart (28 March 2019). The talks will take place at 7.30 pm on each occasion and will also be streamed live on Facebook (www.facebook.com/ccfsouthwark) Those who attend in person will be able to enjoy the hospitality of the CCF from 7 pm onwards.. The Centre for Catholic Formation in Tooting Bec has an exciting programme of courses, events and lectures thiis Spring Term. From the exciting Faith and Art Series looking at photography, literature and music to a thought-provoking series on Lent and the opportunity to learn Makaton (a language programme using signs and symbols to help people to communicate). There's something for everyone with an enquiring mind! You can download the programme by visiting this link. If you are interested in working for CCF, they are currently recruiting for Catechesis Advisor for Kent and two part-time Resource Advisors and an Ongoing Formation / Centre Secretary. Please view at the details listed below. The Roman Catholic Archdiocese of Southwark is looking for an Adviser for Catechesis and Adult Formation covering Kent, to join the advisory team at the Centre for Catholic Formation. The key function of the team is assisting parishes in the work of adult formation, the training of catechists and helping to spread the good news of Jesus Christ (evangelization). Closing date Friday 1st February 2019. The Roman Catholic Archdiocese of Southwark is looking for 2 part-time Resource Assistants to the Centre for Catholic Formation in Tooting Bec. The key function of the Centre is assisting parishes in the work of adult formation, the training of catechists and helping to spread the good news of Jesus Christ (evangelization). Accountable to the Director, the Resource Assistants will seek to revitalise and run the bookshop as well as developing an online sales offering via the Centre website. They will also promote the resources on offer at the CCF both through print and social media. In addition, they will help to organise and run events. Although training will be provided, the ideal candidate will already have good IT skills especially in relation to presentations, social media and websites. He/she will also have excellent communication skills and some experience of catechesis, children’s liturgy or educational work with adults and/or children and an informed understanding of Church teaching. Hours of work per Assistant will be 15 per week in term time only and will include some evenings and weekends. Salary range - £10.00 - £12.00 per hour depending on skills and experience. The CCF is an agency of the Archdiocese of Southwark, responsible for assisting parishes in the work of adult formation, the training of catechists and helping to spread the good news of Jesus Christ (evangelization) across South London and the county of Kent. The OGF arranges training and spiritual support of diocesan clergy both in active ministry and in retirement. We are now looking for an experienced and capable secretary to serve both the Centre for Catholic Formation (3 days per week) and to support the work of the diocesan Ongoing Formation of Priests Committee (2 days per week). This job comprises two distinct roles and the applicant will need to be well organised and diligent. Located at Tooting Bec and reporting to the Director of CCF/OGF, this role is a member of the CCF team and will be required to work collaboratively with colleagues. The ideal candidate will have extensive secretarial in a professional environment with evidence of ability to work effectively under minimal supervision. Up-to-date technology skills, including websites and social media is essential, as is a working knowledge of the Catholic Church. Interested candidates should email their CV together with a covering letter to Sarah Wood, HR Manager. Email: sarahwood@rcaos.org.uk. Closing date for applications is 18th January 2019. A Saviour has been born to us. We live in a demanding world which is often filled with concerns of achievement, gain and sometimes conflict. In our striving it can be challenging to remember that we are precious in the sight of God and he loves us. He wishes to favour us with a unique set of gifts through the birth of his Son, namely peace, love and joy. These gentle offerings cannot be purchased, but can only be openly received from His hand. They are then to be lovingly nurtured in our daily lives, helping us to focus on all that is good with the help of the Holy Spirit, and simultaneously inspiring the wellbeing of our society. Like the shepherds, may we be filled with wonder at the coming of our redeemer in the child-Jesus and with the choirs of angels, exult in this extraordinary moment of God’s infinite love for us throughout eternity, as we wait for the return of his Son. May we carry the hope and benevolence of this season in our hearts throughout the year and be ready to share His treasure with all those we encounter. Anyone wishing to attend services in their local Catholic Church during the Christmas season is welcome to find the contact details of the Parish by accessing parish information on the Southwark Parish Directory tab, which is located on the right hand side of the page or by clicking here. The O Antiphons are verses used at Vespers in the last seven days of Advent in Western Christian traditions and run from 17th- 23rd December in the Catholic Church. Each antiphon reflects on Isaiah's prophecy and is a devotion to the various names of the Messiah. The O Antiphons are thought to have originated in the early, Church, particularly in monasteries, and were in formal liturgical in Rome by the 8th Century. ‘Immanuel’ is a Hebrew name, which later became ‘Emmanuel’ when translated into the Roman alphabet. In this final antiphon we hear of a great longing for the arrival of ‘Emmanuel’ who, it is recognised, will be a just and righteous leader, providing not only hope, but salvation to the people. Isaiah foretold of a young woman bearing a son whom she would name Immanuel (God is with us), which he predicted would be a sign of God’s protection for the House of David. In his Gospel, Matthew interpreted Jesus, whose ancestor was King David, as God’s fulfilment of this prophecy and the true Messiah. This Antiphon reflects the longing of man to understand what it may mean on to see God’s Kingdom realised on this earth. Although we are ‘fashioned from clay’, it is as if our very earthly basis is only brought to life once infused by truly perceiving His wish for humankind. This new Kingdom or reality for our world may be an everyday existence of choosing peace, sharing what we have, bringing about harmony and ultimately realising the Divine’s love for mankind. ‘O Morning Star’ we also find it translated elsewhere as ‘O Dayspring’. All these meanings speak of a new Light, one that has come to share its warmth and radiance with the world. Perhaps most importantly, it is to bring illumination to those that have been in shadow and spiritual darkness. Having been set free by the Key of David, Jesus is our Messiah, the Rising Sun and the Light destined for our world. who first gained acknowledgment as a musician, then as the slayer of Goliath. He anointed King on the death of Saul who was slain in battle with his son. The Antiphons states that the coming Messiah will be the salvation of people and lead us to the Light of God. Jesse was the father of King David, whom it had been foretold would be the root of Jesus' lineage. Forty people braved the rain and wind on Dover Seafront during the afternoon of 15th December in order to attend the inauguration of a new memorial to over 200 migrants who have died in the last 20 years in attempts to reach and cross the Channel to seek sanctuary in the UK. The service was led by the Bishop of Dover, the Right Rev. Trevor Willmott, assisted by the Parish Priest of the Good Shepherd Parish in Dover, Fr Jeff Cridland. Five Mayors from Dover and neighbouring towns were present to pay their respects.The tragic deaths of a number of those involved were recounted as the Mayor of Dover, The Right Worshipful Sue Jones, placed flowers in memory of the victims while the Mayor of Deal, the Worshipful Nick Tomaszewski, read a poignant poem dedicated to all the victims. Anglican & Roman Catholic Clergy including the Dean of Dover, Fr Jeff Cridland, and Mayors from Dover and neighbouring towns congregated. Speaking after the service, Ben Bano from 'Seeking Sanctuary' said: 'Our event today was not about the rights and wrongs of migration but an opportunity to remember all those who have died trying to seek sanctuary in these tragic circumstances. Many of those involved have no one for grieve for them, hence it is only right that we act as a proxy. I hope that the memorial will continue to remind us that, in the words of Pope Francis, 'every migrant has a name, a face and a story'. Only hours earlier, eleven migrants had successfully completed the perilous journey, including four children. A number of the attendees were associated with local and national efforts to provide humanitarian aid, including the Refugee Council. The ceremony ended with remarks by a representative from one such group, Marisa Rickard of Canterbury-based 'Care4Humanity', who included a relevant quotation from the Muslim tradition, 'Use your voice for kindness, your ears for compassion, your hands for charity, your mind for truth and your heart for love'. May those who have lost their lives whilst striving for hope and a new beginning, Rest in Peace. Adonai is the plural form of ‘adon’, meaning ‘Lord’ or ‘Majesty’ and is regularly used to refer to the being of God in the Hebrew Bible. This is perhaps a more personal title than the universal idea of ‘Wisdom’ (O Sapientia). The Antiphon reflects the expectation and longing for Christ on earth, referring to the the event of the burning bush in the Old Testament, when God reveals to Moses that he wishes to send him to Pharoah in order to alleviate the suffering of the Israelites and bring them out of Egypt. Following the successful Carol Service at St George's Cathedral on Thursday night, the Cathedral's talented Director of Music, who will be retiring at the end of this year, will offer a Christmas Organ Recital in the Cathedral on Saturday 15th December between 11 am and 12 noon. This is an opportunity to hear Norman Harper play Olivier Messiaen's masterwork ''La Nativité du Seigneur'. Messiaen completed this work at the age of 27 years and it comprises of nine meditations on the birth of Christ, which collectively seek to convey God's joy in the birth of his Son. Theologically inspired, the composition undoubtedly drew on the composer's faith. However, the stained glass windows in medieval cathedrals near to his place of residence also inspired his writing. For that reason, it is perhaps the perfect piece of music for the beautiful stained-glass setting of St George's Cathedral at this time of year! The concert is free and all are welcome to attend. For more details about all of these events and more, visit the Cathedral's Facebook Page. 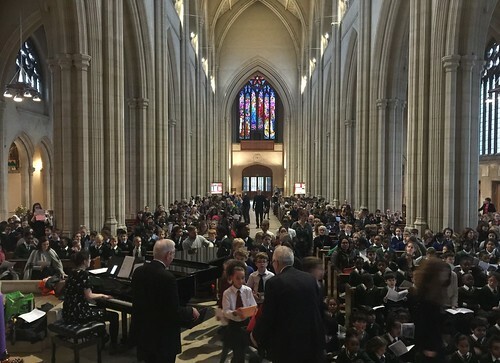 On Wednesday 12th of December, seven Catholic schools in South East London gathered at Sacred Heart Church in Camberwell for the 5th occasion of this musical celebration. The schools were St Joseph's Infant and Junior Schools in Camberwell, St Francis' Primary School, Peckham, St Michael's Secondary School, Bermondsey, Virgo Fidelis Secondary School, Upper Norwood, St Thomas the Apostle Secondary School in Nunhead, and Sacred Heart Secondary School, Camberwell. The parish priest, Fr Victor Darlington, welcomed all the schools and their headteachers, and emphasised the importance of the gathering as a means to express the true meaning of Christmas, namely the birthday of our Saviour, Jesus Christ, echoed in melodious songs in an atsmosphere of prayer. The special guest of honour, Bishop Patrick Lynch, encouraged the congregation to truly live and proclaim the joyful message expressed in the songs,'tonight, this Christmas and always'. He stressed that as Christians we should always seek to follow the true Light of the World, whose birthday we celebrate at Christmas. He offered the final blessing and wished every one present a very happy Christmas. To see more photographs from this event, click here. 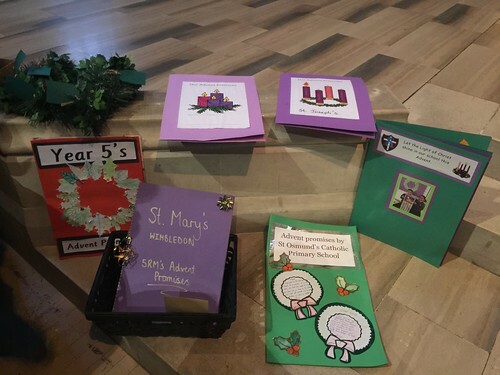 Many congratulations to a Year 6 pupil at St Mary's Catholic Federation in Carshalton: the worthy winner for the Education Commission's recent Christmas Card Competiton. 5 to 14 years were invited to take part in the Commission's competition to design its official Christmas card on one of the following themes. 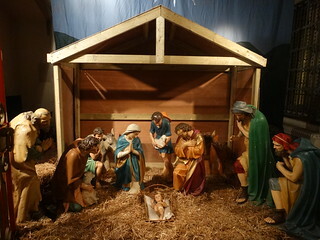 The Deputy Director of Religous Education and Spirituality, Sharon Doherty, said: 'This card was chosen because the judging panel felt it was a lovely interpretation of the Nativity and showed how joyously the invitation to 'Come to the manger' was accepted by those who had to travel far and wide. 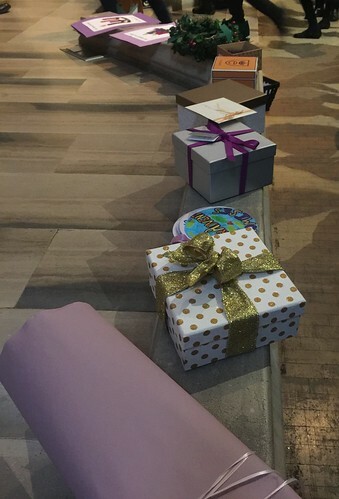 Seventy-seven card submissions were received in total and staff at the Commission then voted on the winner and 11 runners up: the winner received a prize of Cineworld tickets. Congratulatations all those who entered and took part this year! To see all the finalists' pictures, visit our Facebook page. Drawing and Talking is a safe, easy to learn method of working with children, teenagers and young adults, to help with underlying emotional difficulties that may be affecting their learning and behaviour. The foundation course consists of a full day’s training. It is suitable for anyone who is working with vulnerable children and young people. No previous knowledge, training or experience is necessary. Head Teachers, Teachers, Teaching Assistants, Learning Mentors, SENCO’s, Pastoral Care, Family Support Teams or anyone working within the charitable sectors with children, teenagers and young adults are all welcome. This includes the cost of the Drawing and Talking training, resources and materials. Lunch and refreshments will be provided. Further details about the course content can be found here. Please contact clairewilliams@rcaos.org.uk for further information and to book your place now. Each month, Pope Francis issues a video in which he asks us to join with him, via the Worldwide Prayer Network, in order to pray for specific needs within our Church. In December, we are asked to pray for those involved in the transmission of faith. Advent is a very special season in the year with different themes highlighted in each of its four weeks to enable us to prepare and to welcome Christ’s presence in our lives. So often in our fast paced world we find ourselves run off our feet and exhausted by the frantic build up to Christmas and we completely lose this special time to take stock and renew our relationship with God and prepare for the coming of his Son at Christmas. To help make some space and focus on the development of this most precious relationship, the Archdiocese of Southwark Spirituality Commission have once again produced a handy daily email to enable reflection. The focus will be on the readings for each Sunday in Advent. Every day there will be a different reflection; so each week, Monday and Tuesday will focus on the First reading, Wednesday on the Psalm, Thursday and Friday on the Second reading and Saturday and Sunday on the Gospel. These reflections are designed to draw us deeper into the mystery of the Advent season and allow us to hear the readings anew, looking at where the readings resonate in our own lives and how they can draw us closer to God. The brief reflection will be sent directly to your inbox to make it as easy as possible to take a little time out each day. So wherever you are, and whatever time you can invest in your personal advent preparation – you will have the resources to hand! Archbishop Peter has written a Pastoral Letter to be read at Masses on the First Sunday of Advent 2018 - Sunday 2nd December 2018. In it he reflects on the scandal of abuse in the Church. "These crimes have caused a terrible wound in the hearts of the victims of that abuse, and in the community of the Church, the community of God’s people, the body of Christ on earth." On Wednesday 28th November Aid to the Church in Need and Christian Solidarity Worldwide asked us to stand in unity with persecuted Christians and other faith minorities who suffer unjustly for their peacefully-held beliefs. At St George's Cathedral in Southwark, the inside of the church was decorated with red flowers and church vestments. 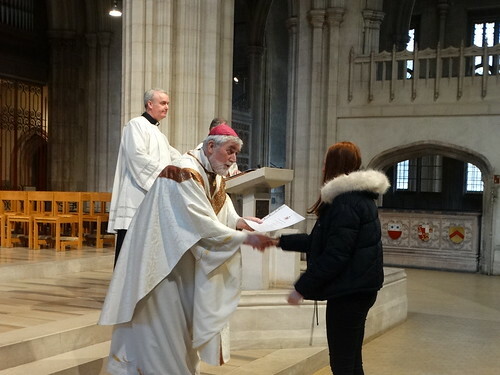 Archbishop Peter, along with the Cathedral Dean and a number of staff lent their personal support to the Campaign. From the late afternoon onwards, churches and other public buildings lit up red to highlight the persecution of Christians and other faiths. A procession of the Cross by candlelight took place between Parliament Square and Westminster Cathedral in the evening. The torrential rain had not dampened Spirits as a large crowd gathered outside Westminster Cathedral, Those present heard a moving family testimony via a live link from Aleppo whilst the National Director of ACN, Neville Kyrke-Smith, and Mervyn Thomas from Christian Solidarity Worldwide spoke alongside church leaders of various faiths of the need for peace. Prayers were offered for those who have died as well as those who are being persecuted for their faith at present. In addition, heartfelt prayers were offered for persecutors; that they may come to a realisation of their actions and seek a new way to resolve differences. In a world buzzing with social media and selfies, the Church wants young people to hear the message that there is ONE filter that helps us stay true to ourselves, that helps us all to measure our lives in the right ways and present ourselves to others as we are. This is the filter of God’s Love. Canon Hearn took part in this year’s Lord Mayor’s show and rode in the procession with the new Sheriff. As Chaplain he will attend events in the City of London. There are two sheriffs in the City of London who support the Lord Mayor during his year of office. We are delighted to announce the official release of a new CD by St George's Cathedral Choir in Southwark. The CD, which has been exquisitely recorded by Regent Records, features a wealth of repertoire for the Christmas Season. In addition to traditional carols such as 'Silent Night' (arranged by Norman Harper: the Cathedral's Director of Music) and Plainsong for Christmas Day, there are Christmas motets such as John Tavener's rousing' God is with us' and James MacMillan's mysterious 'In splendoribus sanctorum', whose trumpet solo proclaims the arrival of the Christ-child. With great encouragement from Archbishop Peter Smith and senior clergy, this is the second disc recorded by the Cathedral Choir. Although its duties consist mainly of singing for Cathedral services, recording a disc is of great help in consolidating the Choir's work throughout the year. 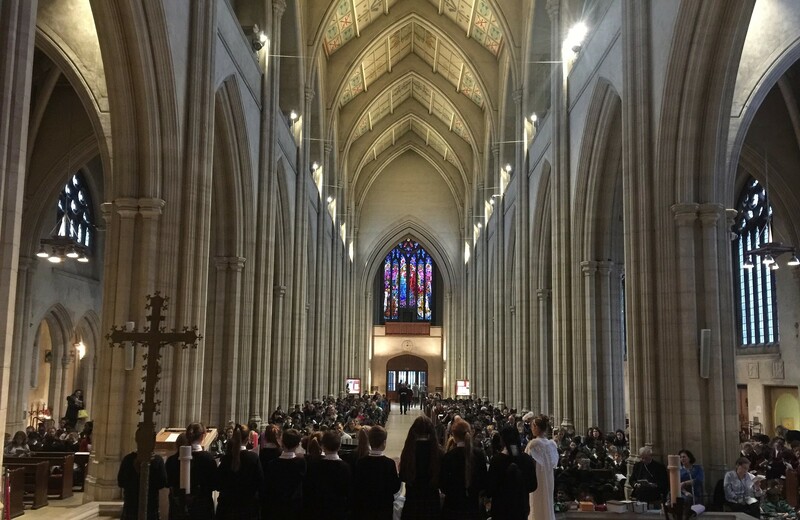 For many of the girl and boy choristers, working with professional adult musicians is a unique opportunity which fosters their love of music and helps them to grow in faith as well as understanding of liturgy. Many benefit from being part of a team who strive for excellence and discipline at the same time as having fun and forming friendships within the Church. These are important qualities and opportunities that every young person can take forward in life. This disc booklet features texts and translations alongside beautiful Cathedral imagery. It is an excellent present for music-lovers and those who cannot easily attend their parish at this time of year. Many of the items on this disc will be performed during the Cathedral Carol Service on Thursday 13th December at 7.30 pm. Entry is free and all are very welcome to join the Clergy and Cathedral Choir in sing carols, listen to Christmas readings and enjoy inspiring choral music. The disc IS NOW ON SALE through the St George's Cathedral website. At the eleventh hour on the eleventh day of the eleventh month in 1918, news came of the Armistice and the end of hostilities in the Great War. There was, as one would expect, great joy on the battlefield and much celebrating around the world. After initial exultation came the need to piece life back together after four years of war. Sickness, disability, lack of employment, the return of women to 'ordinary domestic life' and financial challenges across the globe continued to cause upheaval. The required change in mindset to accept peace was effectively a social shockwave, as noted by Cardinal Bourne, who was Archbishop of Southwark until 1903. Looking back, it is hard to imagine the enormity of recovering from such an experience. Reading these tags of witness immediately explains this teaching: the cards show honesty, lack of complication and straightforward understanding of personal responsibility with regard to engendering a positive society. In contemporary times Pope Francis has stated that 'the world is at war' , going on to point out the cost to innocent life because of conflicts of interest. In Southwark, recent news of violence on South London streets has made us all too aware of how quickly and easily hostility can flare-up with tragic consequences. The Catholic Church and its chaplains played a vital role in the First World War. Many became soldiers or otherwise found themselves comforting the sick and dying in extreme circumstances. In 1918, ordinary people were clinging desperately to the church for answers whilst others felt their beliefs had been smashed by devastating sights and experiences. Perhaps only time, along with God's love and gentle call to forgiveness, can hope to bring about healing from such significant distress. However, in contemporary society we can choose to adopt a considered Christian response to everyday discord: it is perhaps these perceptions that older generations need to share with the young. This Sunday morning churches throughout the world will mark Remembrance Day and the Centenary of the 1918 Armistice. As Catholics we are encouraged to participate in local civic or ecumenical celebrations whilst parishes are encouraged to ring church bells (where they exist) at 12.30 pm. A Remembrance Service will commence outside St George's Cathedral at 11 am and Archbishop Peter Smith will be celebrating Mass in the Cathedral at 11.30 am. All are very welcome. We offer deep and humble gratitude to those who have given their their lives fighting for peace. We pray for their eternal rest and that their great gift will inspire future generations to learn how to foster harmony and resolve conflict. 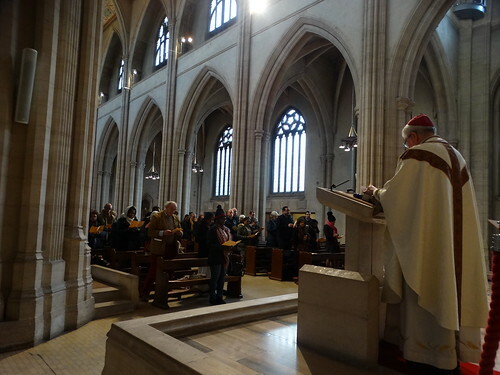 On Saturday 3rd November a significant celebration took place at St George's Cathedral, Southwark when a National Mass was offered in thanksgiving for the canonisation of Oscar Romero. Clergy and laity gathered in honour of one of the Catholic Church's newest and perhaps most anticipated saints. Since his assassination in 1980, people around the world have waited for news of Romero's beatification, which was initially announced in Spring 2018. Known to speak up on behalf of the oppressed and voiceless, he attracted enmity from the state for his broadcasts and other channels of communication, which often listed those who had 'disappeared' or been killed during a time of deep unrest and eventual revolution in El Salvador. Did Oscar Romero set out in life to become a saint? I am quite sure that he never considered himself to be worthy or holy enough.... as Emeritus Pope Benedict XVI observes 'holiness is not a quest for perfection but a willingness to unite ourselves to Christ, so that we may become perfect.' That willingness to unite himself to Christ was at the heart of Archbishop Romero's vocation to Christian discipleship and it led him to treasure and embody integrity. For the full sermon click here. Towards the end of the service, Archbishop Peter led the congregation in an Act of Affirmation at the Romero Cross, which houses relics of the saint and sits in the Romero Shrine, as decreed by Archbishop Peter Smith on 14th October 2018: the date of Saint Oscar Romero's canonisation. Be at one with the Church of God throughout the earth in proclaiming Good News to the poor, freedom to those who are in chains, vision for those who cannot see and dignity for all the oppressed. This we seek to do in the name of the transfigured Christ. Amen. The service closed with a rousing version of Laudate, led by Canon Alan McClean, and an invitation to those gathered to visit the Romero Shrine. With grateful thanks to M Mazur of the Catholic Bishops Conference of England and Wales for these images. For more photos click here. During the last week of October 2018, two parishes celebrated their 175th Anniversary. The first was St Peter the Apostle in Woolwich, which has a rich history and was built by AWN Pugin. 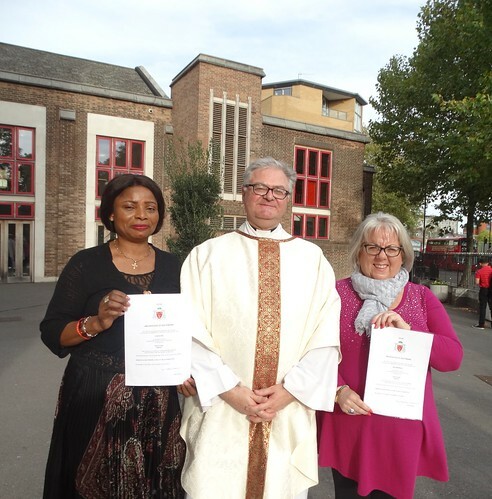 Leading the celebrations on 28th October were were Bishop Pat Lynch, Auxiliary Bishop of Southwark Diocese and Fr Michael Branch, Parish Priest of St Peter’s. Guests included the Mayor of Greenwich, Matthew Pennycock MP, Len Duvall from the London Assembly and local councillors. During the 11.45 am Mass, which remembered the opening ceremony of 1843, Bidding Prayers were said in nine languages, whilst seven candle bearers represented the Seven Continents in order to reflect the diverse nature of the parish. The Air Cadet Corps Band played before and after the Mass, representing the church’s military connection. The plot of land for this parish was granted by the Ordnance, who appointed Augustus Welby Pugin to design a parish church: now thought to be his first, although he had already built 3 Cathedrals by 1841. 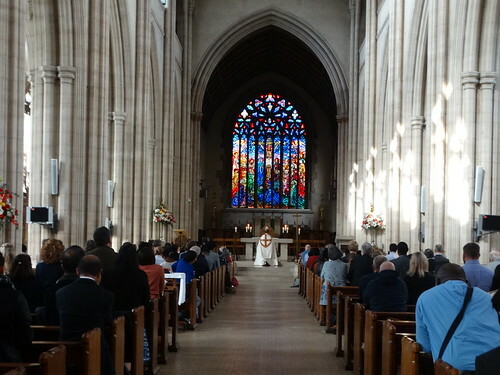 “Here at St Peter’s, Woolwich we are all immensely proud to celebrate the Church’s 175th anniversary. It’s our history that helps us understand who we are today. Since it’s inception, migrants from Ireland and other European countries found a safe spiritual home to Worship God and to put their faith in action. Today the Church provides a home to a multicultural world wide Catholic Community, as it continues to inspire priests and people to live faith in action for the common good. After the service a shared meal of various cuisines was enjoyed by the parishioners and guests in Pugin Place: an old school building which now serves as a community centre. The current church building retains a number of original features, including stained glass by John Harding, ceramics by Henry Minton as well as a set of Stations of the Cross originally donated by St George’s Cathedral. All are welcome to visit. The second parish was on the very border of the Southwark Province (rather than within the Diocese), located in Penzance! With Bishop Mark O'Toole of Plymouth at the 2018 Synod in Rome, the parish of The Immaculate Conception of Our Lady invited Archbishop Peter Smith to join clergy from across Cornwall and Devon in to celebrate the 175th anniversary of Penzance Catholic Church, and the completion of a £250,000 restoration of this historic church. Father Philip Dyson, parish priest, was appointed Honorary Canon for his work serving the mother church of Immaculate Conception of Our Lady, Penzance. 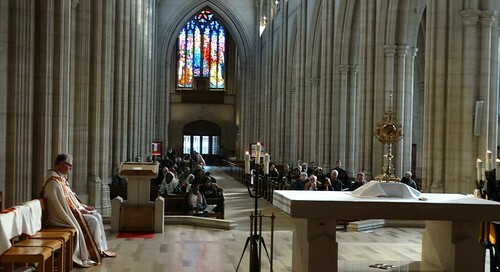 Around 200 parishioners attended the Anniversary Mass, which also celebrated the completion of a major redevelopment project, providing much-needed modern facilities and including the installation of two stunning new stained-glass windows depicting the luminous mysteries of the Rosary, as promulgated by Pope John Paul 11. The works were paid for by parish fund-raising. The second reading was from Corinthians 1: 3:9, in which St Paul says to his followers “You are God’s field. You are also God’s building”. All gathered enjoyed refreshments in the Church Hall after the service and spent time talk about their part in the history of the parish. We wish both parishes well as they look forward to their next major milestones and the growth of their unique communities in Christ. 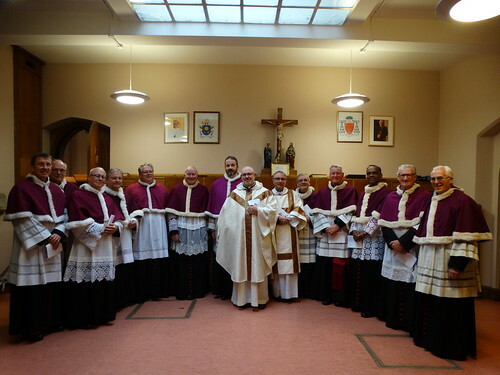 Inspired by the Adoremus Eucharistic Congress in Liverpool last September, Fr Innocent Abonyi has instigated the Guild of the Blessed Sacrament in his parish of St John the Evangelist, Gravesend. The Guild promotes greater reverence to Christ in the Eucharist, with members praying for an hour before the Blessed Sacrament and also taking turns to welcome others to the church during exposition. Listen to this short interview with Fr Innocent, recorded by the Catholic Bishops Conference of England and Wales. The Archdiocese of Southwark is offering an Organ Scholarship at St George’s Cathedral to a music student or recent graduate. The Cathedral has both a boys and a girls’ choir, supported by professional lay clerks. The scholarship is open to an organist and conductor seeking to further his/her experience in the field of church music. • Both the 10am and 11.30 Sunday Masses in term time, with rehearsals, and other major festivals, for instance Maundy Thursday, Good Friday, Easter Vigil (not a complete list). The first Sunday rehearsal is at 9am. • To be present for either the choir practice from 6 to 7.30 on Wednesday evenings or from 5.30 to 7.00 on Friday evenings, either accompanying or doing general administration. • To do miscellaneous administrative tasks and attend occasional meetings as required. • An organ playing standard including sight reading and transposition to at least Grade 8 (ABRSM)/ ARCO plus fluency in playing hymns. • Experience in conducting choirs and confidence in leading young people. • The ability to learn music quickly. • Access to a computer, with fluency in Microsoft Word and the internet. • A responsible approach to all commitments, including excellent preparation and punctuality. • An enhanced DBS disclosure will also be required. For more information and to apply please email Sarah Wood at sarahwood@rcaos.org.uk. Please ensure that your CV and any covering letter includes your organ playing and choral conducting experience, whether or not you have had any previous church appointments and your current occupation. The deadline for applications is Friday 16th November. Auditions and Interviews will take place on Friday 30th November. Funeral Mass will be at Aylesford Priory on Saturday 3rd November at 11.30 am with a burial in the community cemetery. On Sunday 21 October 2018 Bishop Paul Hendricks installed Fr Alberto Pelucchi of the Comboni Fathers as Parish Priest of St Joseph’s Parish in Roehampton. Among those present were the Dean of Mortlake, Mgr William Saunders and the Provincial of the Comboni Fathers. Founded in 1867 by St. Daniel Comboni, the Comboni Missionaries are an international Catholic organization dedicated to ministering to the world’s poorest and most abandoned people, often working in unstable political climates and in the midst of extreme poverty. They seek to protect the dignity of all people and to serve them. The Comboni Missionaries have carried their mission across the world for 150 years, sharing the good news of Christ. There are currently 3,500 missionaries working in 42 countries. A concert will take place in St George’s Roman Catholic Cathedral, Southwark, on 24th October 2018 at 7.30 pm in order to mark the World War I Centenary Armistice Day, the recent Canonisation of Archbishop Oscar Romero and the 400th Anniversary of the execution of Sir Walter Raleigh. Under the direction of Douglas Tang, soloists will combine forces with ArchiCantiores and The Museum Singers (from the Imperial War Museum) in order to offer a recital of poems and songs from the 1500’s to the present day via the Boer and First World Wars. The chapels and shrines of the Cathedral will help to inform the choice of repertoire as the musicians weave their way around the building. Compositions will include works by Palestrina, Samuel Barber, Benjamin Britten and Kurt Weil, which will be interspersed with words by Wilfred Owen, Oscar Romero, Dylan Thomas, Rupert Brooke and a newly commissioned poem entitled ‘Duet’ by Paul Munden, Director of the National Association of Writers in Education. Prior to the concert, a reception will be held in Amigo Hall, during which a talk will be given by Julian Pinnick. A gifted artist, Julian has created the ‘Southwark Triptych’ which depicts a contemporary setting of the Deposition from the Cross (also known as the Pieta). The Most Reverend Peter Smith, Archbishop of Southwark, will accept the Triptych on behalf of the Roman Catholic Archdiocese of Southwark during the reception. The painting features Borough Market (as seen on the concert poster) and Archbishop Peter Smith will confer the painting on the Church of the Most Precious Blood, which is located in Borough and is the nearest Catholic Church to London Bridge. The Triptych will be available to view in the Lady Chapel at St George’s Cathedral for a limited period of time after the concert. Doors open for the concert at 7 pm. Concert tickets are £10 / £8 concessions, U18s Free. Reception tickets: £15 / £10 concessions. Proceeds from the concert (after expenses) will be donated to the St George’s Cathedral Lighting and Audio-visual project. Archbishop Peter Smith visited St Thomas’ Catholic Primary School in Canterbury on Friday 5th October 2018, to celebrate the official opening of the school’s new classrooms. The morning began with Mass in the school hall, where the Archbishop was joined by local clergy, governors, pupils and families, to celebrate the start of a new school year. During the Mass, children led on readings, offertory and altar serving, as well as joining in enthusiatically with the singing. 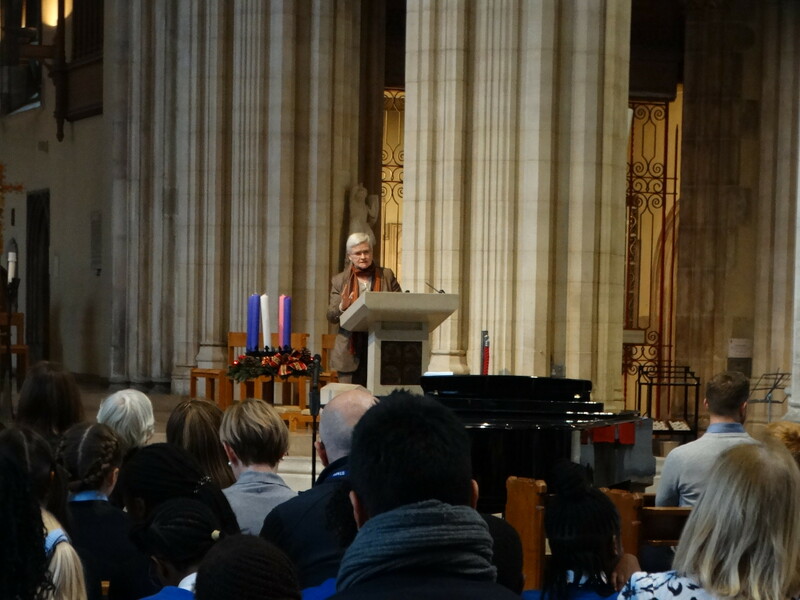 Before mass concluded, Miss Lisa D’Agostini (Headteacher) took to the lectern to talk about a special award being presented by the Archbishop to Mrs Marion Nash. Mrs Nash has devoted 30 years of service to St Thomas’ Catholic Primary School as a Governor – the last 20 years were served as Chair of Governors. During the summer, Mrs Nash decided it was time to step back from being a Governor and so the school, along with the Archdiocese, decided to mark her dedication and commitment to the school and parish life, with a special diocesan award. After mass, parents and guests had the opportunity to meet the Archbishop over light refreshments. Once the children’s break time had finished, Archbishop Peter Smith visited each classroom to speak with the children and answer any questions they had. Archbishop Peter Smith and Mrs Marion Nash officially opened the new classrooms by cutting a ribbon and a plaque was installed to mark the occasion. 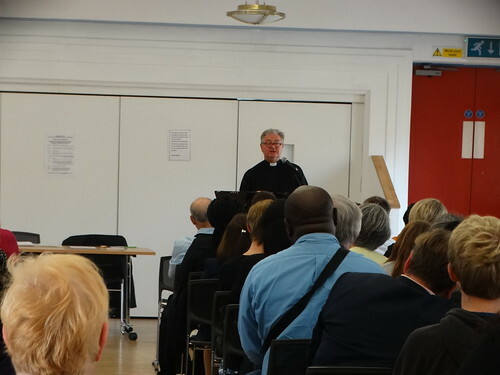 In attendance for this short ceremony were representatives of the many agencies involved, including the Education Commission for the Archdiocese of Southwark who secured the funding and Faithorn Farrell Timms who were the project’s Architect and Agent. Archbishop Peter Smith was given a tour of the new building and blessed the classrooms with holy water. After several years of planning for replacement classrooms, building work was finally completed before the summer holidays and children moved into the new building this September. Further works are expected to begin within the school over the next few weeks. On Saturday 13th October 2018 Bishop Pat Lynch commissioned 125 people as Extra Ordinary Ministers of Holy Communion. We are delighted to announce that Archbishop Peter has formally decreed the Romero Space in St George's Cathedral to be a Diocesan Shrine, as of Sunday 14th October 2018, the date of Oscar Romero's canonisation. The Romero Cross within the Shrine area holds a reliquary containing a piece of cloth from the alb that Romero was wearing when he was assassinated and also his zuchetto (skull cap). All are very welcome to visit the Shrine. Please scroll down to read more about Romero. This Sunday, 14th October 2018, Blessed Archbishop Oscar Romero will be canonised in Rome, alongside Pope Paul VI. Archbishop Peter Smith will, on the same day, issue a decree officially designating the "Romero Space" in St George's Cathedral a Diocesan Shrine. Oscar Romero y Galdámez was born on 15th August 1917 to Santos Romero and Guadalupe de Jesús Galdámeza and showed signs of seeking a religious life at an early age. He became a priest in 1942, having waited a year for his ordination as he was a year below the required age of 25. He was appointed and installed as the fourth Archbishop of San Salvador in 1977. He spoke passionately against injustice, corruption, poverty, torture and assassination, being greatly affected by the assassination of a close priest friend who worked extensvely with the poor, only weeks after his installation as Archbishop. In 1979, the revolutionary government Junta came to power, and with it a notable increase in human rights abuses. The increasingly violent behaviour would develop into the Salvadoran Civil War. Romero stated to Pope John Paul II that it was 'difficult to support the government in Salvador because it legitimized terror and assassinations' and he often used his radio broadcasts to list the names of those that had disappeared or been either tortured or murdered. His diocesan newspaper offered the same information to its readership. His outpoken behaviour and actions won much admiration across the world but also many enemies in the right-wing political leadership. On 23rd March 1980, he preached a sermon in which he called on Salvadoran soldiers, as Christians, to 'obey God's higher order and to stop carrying out the government's repression and violations of basic human rights'. Romero was assassinated the next day on March 24th 1980 as he was celebrating Mass in the chapel of the Divine Providence cancer hospital in San Salvaodor. The gunman has never been identified, but the State acknowledged their fault and responsibility in his murder. Romero's funeral took place on 30th March 1980 with over 250,000 mourners present from all over the world. His body is buried in the Metropolitan Cathedral of San Salvador. On 23rd May 2015, Archbishop Oscar Romero was beatified in the Plaza El Salvador de Mundo, The service was presided over by Cardinal Angelo Arnato S.D.B. on behalf of Pope Francis. He was granted patronage of Christian Communicators by the Universal Church. Arnato spoke of him as "beloved, peacemaking man of God'', whilst Pope Francis said that Romero's voice was one that 'continued to resonate'. The Romero Cross, which is situated in St George's Cathedral between chapels dedicated to St Joseph and St Patrick, was commissioned by The Archbishop Romero Trust in conjunction with the Cathedral. It houses a reliquary containing Archbishop Romero's zuchetto (skull-cap) and a piece of the alb that he was wearing when he was martyred on 24th March 1980. 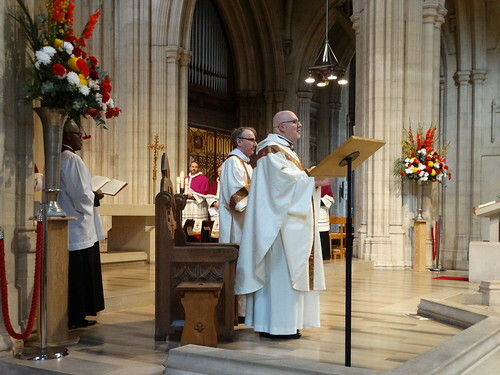 The striking Cross was blessed on 19th September 2013 by Archbishop Peter Smith and dedicated to the late Bishop Michael Evans, former Bishop of East Anglia and a Southwark Priest who held Romero in great esteem and who died of cancer in 2011. In order to mark the Canonisation, the Romero Trust have offered an A3 portrait poster of Saint Oscar Romero to all parishes and schools in Southwark, you are welcome to download the poster here. Those wishing to mark Romero's Canonisation are welcome to attend a National Mass of Thanksgiving which will take place in St George's Cathedral on Saturday 3rd November at 12.30pm. Archbishop Peter Smith will be the Principal Celebrant. All are welcome to visit the Shrine and attend the Mass. Southwark's Diocesan Chancery has revised and added information to its page on this site. The Chancery forms for Marriage, Reception into full communion with the Church and the Commissioning of Extra-ordinary Ministers of the Eucharist are now available for priests and deacons to download from this page. Please click on the logo above to visit this page. The page for Diocesan Organisations and Agencies has links to those working in the Diocese in education, catechesis, youth work and the administration of the Diocese. The Parish Websites page lists all those parishes that have a website. The general Catholic information page gives a few links to major Catholic Websites. The Bishops page tells you a little about our area Bishops and our Archbishops and Bishops Emeriti. The Nullity of Marriage page gives a brief introduction, answering some common questions about the process.